Writer Robert Louis Stephenson (1850 – 1894) had a fascination with the grisly underbelly of his native Edinburgh that wasn’t just a prurient pleasure enjoyed by a slumming well-to-do gentleman. It also inspired his darkest fictional writing about the evils that men may do. The dissembling of a violent beast behind the demeanour of seeming virtue in Strange Case of Dr Jekyll and Mr Hyde (1886) was influenced by Deacon William Brodie (1741-1788), a respectable security expert who ran a double life exploiting his skills to burgle the homes of the city gentry whose reputation he cultivated by day. A more infamous case that was ideal fuel for Stephenson was the sensational true story of William Burke and William Hare who, along with accomplices Helen M'Dougal and Margaret Hare, carried out 16 grave-robbings during 1828 and sold them to eminent surgeon Dr Robert Knox who constantly needed fresh corpses to dissect with his students. The case exposed much that been hidden from the public including the ethical problem of how to maintain viable ongoing medical research when the only cavaders allowed were the limited supply gained legally from suicide, prison death or orphaned or foundling corpses. The temptation of a lucrative black market’s supply and demand easily outweighed morality, especially if one argued the greater gain to society. Hare cut a deal to inform on his cohorts in lieu of prosecution. Ironically for Burke his conviction resulted in his own hanging and dissection and whose skeleton to this day is displayed within Edinburgh Medical School’s Anatomical Museum. Stephenson’s resulting short story The Body Snatcher was printed in December 1884. Unsurprisingly a version of the Burke and Hare origin story eventually found its way onto the silver screen; fortunately for horror fans the first notable film to use it was produced by Val Lewton as part of his 1940s tenure at RKO Studios. As usual, Lewton involved himself fully in the screenplay co-written with Philip Macdonald who had experience conveying an unsettling Gothic sensibility for Alfred Hitchcock’s Rebecca (1940). Lewton chose Robert Wise to helm a third project for him, following up his impressive directing debut rescuing the over-running Curse of the Cat People (1944) and the period war drama Mademoiselle Fifi later that year There was no doubt though whose influence on the film was ultimately felt the most. 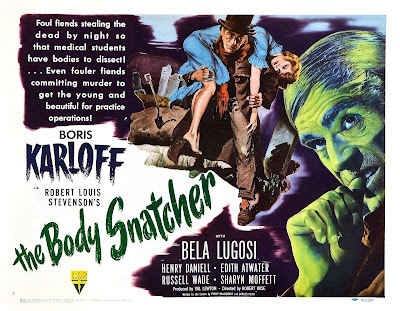 Once again The Body Snatcher bore the stamp of a Val Lewton film that belied its title with much greater thematic depth and artistry than a standard B-movie. The talented producer not only added literary lustre to the project, he also gave it a star in need of a career polishing – however under somewhat strained circumstances. As we saw in Arsenic and Old Lace, Boris Karloff had come back to Hollywood refreshed from the show’s stage success yet soon found himself set back again by the relative failure of 1944’s The Climax and then the crumbling façade of Universal’s horror franchises with House of Frankenstein (both reviewed here) – albeit with the latter providing a very companionable shoot. 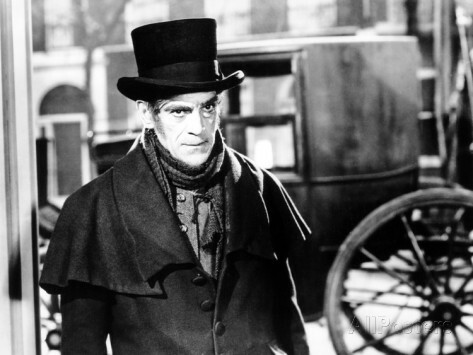 It was during the Frankenstein filming that Karloff was contacted by RKO with a view to working on their horror films. An exciting prospect indeed but one that Lewton was actually resistant to, being instead the brainchild of the studio’s new boss, former Universal executive Jack G Gross. Stephen Jacobs’ biography quotes Robert Wise when he along with fellow director Mark Robson and Lewton reluctantly first met the English actor: “-but when he turned those eyes on us, and that velvety voice said ‘Good afternoon, gentlemen’, we were his and never thought about anything else”. Karloff signed with RKO on May the 18th 1944. It was to be the beginning of a happy partnership between star and studio. While Gross revealed a coarseness of approach in what he wanted to see on screen, Lewton soon discovered a kindred ally in Karloff, an artist who shared his refined taste in horror aesthetics. As we’ve seen, Karloff had certainly suffered his unfair share of movie roles catering to the lowest denominator of audience and filmmaker. He appreciated that his new producer’s films “were based on the principle of making the audience do most of the work, using hints and suggestions which each spectator’s imagination could play round”. Karloff’s initial workload did not go according to plan. Isle of the Dead was to be his opening commitment, but agonising back pain that had begun on The Climax meant that he could only endure part of the scheduled shoot. Lewton was forced to shut down production while the star went into hospital for spinal fusion and a month’s recuperation. Thus The Body Snatcher now had to precede it. Despite Lewton’s sensitivity and restraint with screenplays, the original script of The Body Snatcher was to contain such graphic scenes of the grave-robbers’ handiwork that the Breen Office insisted they be removed. 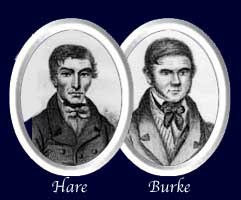 (Even upon release, any mere mention of Burke and Hare was trimmed from the British print and it was not until 1998 that UK video audiences could finally see an uncut version). In constructing the movie and to better position their headlining actor, Lewton and Macdonald gave greater prominence to Karloff’s role, the evil Cabman John Gray than he had in Stephenson’s story. There, the essential plot revolved around a cover-up of Gray’s murder by eminent Dr Macfarlane and his former medical school colleague Fettes whom he pressurises into support with the threat of revealing their sordid past paying for stolen corpses. For this reimagining, The Body Snatcher would stress Macfarlane more by having Gray as his malevolent supplier (a combined Burke/Hare to his Dr Knox in effect). This creates a gripping high-stakes dilemma of forced secrecy upon MacFarlane and a complex deep-seated relationship between the two men. The production was on securer ground with its casting. To play the scheming McFarlane RKO wisely cast Henry Daniell, a renowned go-to figure for a particular type of British sneaky epicene villainy - so much so that Christopher Guest’s preparation for his marvellous Count Rugen in The Princess Bride (1987) was to study Daniell’s Lord Wolfingham from The Sea Hawk (1940). By contrast, wholesome junior doctor Fettes is Russell Wade, a Lewton company player whom you may recall was the fleeting near-saviour to the ladies in The Leopard Man (1943), then awarded a lead hero role befitting his innate decency persona in The Ghost Ship that year. Although Wade is a little stiff and over-earnest at times, he has a natural warmth and bedside manner with crippled child Georgina Marsh (Sharyn Moffett) that is crucial in establishing a major theme of the film. The difference between his humanity and MacFarlane’s frosty professionalism that she is unresponsive to emphasizes that medical treatment needs to more than just clinical knowledge for the patient to respond. The doctor must have a feeling for healing as it were. (Much later Fettes will sum up his mentor’s shortcoming: “But he couldn’t teach me the poetry of medicine”). Someone else equipped with a kindly soul is Mary Gordon’s Mrs McBride, an early mourner unaware of the post-mortem use made of her son. Gordon was best known as housekeeper Mrs Hudson in the Basil Rathbone Sherlock Holmes films. Her buried boy also becomes a neat opportunity for another ‘true’ Edinburgh character to be woven into the tale. Greyfriars Bobby was a Skye Terrier who famously (if real) spent the last fourteen years of his life till 1872 sitting atop the grave of his dead master John Gray refusing to leave. Since Karloff’s part only shares the same name, this was perhaps enough to connect the two – other than the scene where Gray relieves Bobby’s duty with a fatal spade blow but fortunately for dog-lovers this is off-camera. It isn’t only a legendary pooch that’s ignominiously snuffed out in The Body Snatcher. 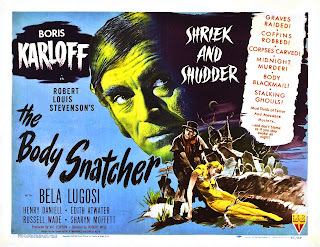 Horror fans seeing the poster expected another Karloff-Lugosi team-up - it occurs but merely served to highlight the disparity between the two friends’ respective statuses by then. 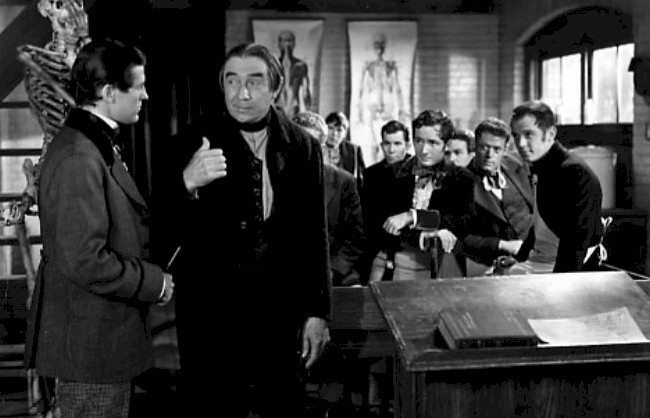 While Karloff revels in his lead part, blackmailing Daniell with lascivious glee and wicked grins, Lugosi is merely spotted a couple of times eavesdropping on the periphery of events as medical school janitor Joseph. When he and Karloff finally do cross paths so Joseph can extort cash from him, Karloff gets to hog the scene, leading Lugosi a merry jig of ghoulish seduction much to Joseph’s under-written bemusement: “I don’t understand the song…” The only dignity really accorded Lugosi is that his suffocation by Karloff is held for impact while the combatants are artfully half-lit by Lewton’s house cinematographer Robert de Grasse. De Grasse’s work on the film is imaginative enough to draw attention to itself in the best way. Coupled with Terry Kellum and Bailey Fesler’s eerily effective sound design, the murder of the Street Singer (Donna Lee) scene for example shows what can be achieved with simplicity rather than banality. We hear the lonely echo of Gray’s horses’ hooves underscoring her ditty as the camera watches his carriage following her through the archway. The shot doesn’t take us any further in, swallowing the arch in shadow. The take continues, leaving us hanging helplessly – then suddenly her voice is cut off – no scream, just abrupt silence. How easily a life may be extinguished anonymously in the big city. The most interesting aspect of The Body Snatcher is the bond that unites MacFarlane with his ever-present nemesis. While the doctor is sickened by the ongoing need he has for Gray’s nocturnal excavations, the latter gains a perverse strength from their relationship that he will never give up. He cannot resist the constant taunting of ‘Toddy’ because without the blackmail grip he has upon him Gray is just a lowly working cabman, and yet: “As long as the great Dr MacFarlane jumps to my whistle I am a man”. He is possessed of more than incriminating history though about the anatomist. That piercing gaze of Karloff shrewdly penetrate his employer’s soul, echoing Fettes when he says “There’s a lot of knowledge in those eyes – but no understanding”. A sense of inexorable doom shackles these two partners in crime together, a Gothic dread that will suffocate them as much as their own victims. Rita Corday’s Mrs Marsh see it with the second sight of the ancient Highlanders; her prophecy to Fettes drips with nightmarish Gothic imagery: “The pit yawns for them”. Evocative period lines like this balance an awkward faux-Scottish tendency throughout the script – variations on ‘Aye lassie’ etc - that clang like shortbread tins out of the mouths of the firmly English and American-accented cast. Sure enough, the foretold retribution comes to pass and with a startling resolution payoff thanks to powerful direction and de Grasse’s stunning lighting. Cleaving to Stephenson’s ending, MacFarlane takes over the body-snatching with Fettes as his unwilling assistant and is horrified to discover that the female body they’ve dug up is actually Gray. “Never get rid of me” his voice teases from beyond the grave. As MacFarlane drives the carriage through lashing rain, Gray’s corpse then falls over him just as a lightning flash hits; his body glows with almost supernatural phosphorescence in a grotesque parody of a ghost haunting his ex-partner. No wonder MacFarlane takes the low road – to a fatal crash. A pulse-pounding conclusion to a well-told tale. As such fertile burial ground for horror, the grisly story of Burke and Hare’s nocturnal enterprises has since been remade by director Freddie Francis as The Doctor and the Devils (1985) and by John Landis with Burke and Hare (2010) starring Simon Pegg and Andy Serkis.